The Nationals are poised to compete for another NL East crown in 2019, but they'll do so without Bryce Harper. Thus marks the beginning of a new era of Washington baseball. If you’re unfamiliar with A.J. Preller, I’ll save you the Google search — he’s the GM of the San Diego Padres. In the first four full seasons since his hire in August of 2014, the team has gone 279-369, averaging 92 losses per year. This is where the state of baseball rests in 2019, with the odd deference to and lionization of the Ivy League educated corporate headhunter superseding the superhuman athletes actually winning games. The tighter your spring and summer nights are tied to the base three rhythms of our hometown nine, the more you probably understand where all this is going. You cannot claim that the Washington Nationals aren’t trying to win. They’re one of the only teams still treating free agency as one should, snaring one of the top starters on the market, tactically addressing their catching void and bolstering their bullpen, along with adding a veteran infield bat. There’s a very good argument to be made that the team spent the money it might have allocated to Bryce Harper in a far smarter way, with not just better expected value, but better protection against the flukes of injury luck by spreading out the risk over a handful of players. There’s a separate, related argument to be made that Anthony Rendon is a better overall player than Harper, and more deserving of his own extension, which is made more palatable by not having re-signed Bryce. With all due respect to Jordan Zimmermann, the Nats have never lost a homegrown superstar before. It’s an experience fans of most teams endure at some point: Mike Mussina leaving the Orioles for the Yankees, Jason Giambi leaving the A’s for the Yankees, Alex Rodriguez leaving the Mariners for the Rangers and, eventually, ugh, the Yankees. It’s hardly a death knell. Both those A’s and Mariners teams actually got better after watching their stars leave. But when a team has the means — as the Yankees do, who never let a true star go; as the Nationals do — it begs the question: What is the purpose of owning a baseball team? There was surely a number that would have been enough to keep Harper, one the Lerner Family could have afforded to pay (a reminder: the luxury tax is not a salary cap). That price may have been higher than it needed to be once the team failed to jettison its malcontent rental closer after said ruffian tried to wring the swag right out of Harper’s throat at the end of a lost season. But as the food offerings at Nats Park suddenly include oysters and Caviar — the high-end food delivery service, not the fish eggs, though considering the former is named for the latter, is there really any difference? — it’s fair to ask what all of this ever higher-end entertainment is here to serve. Wouldn’t fans prefer to cheer for Harper, forever, in pursuit of a championship? They’re certainly still paying as if Harper is still here. A co-worker sent an email out last week, offering to sell their two Opening Day seats in the 100 level, down the first base line past the home dugout, at cost. That cost was $347.50. Nearly $175 per person, before parking, or a place to store your backpack, or a program, or a hot dog, or a beer, or, god forbid, a steak and fries from Medium Rare. All of that to see a Nationals team without Bryce Harper. 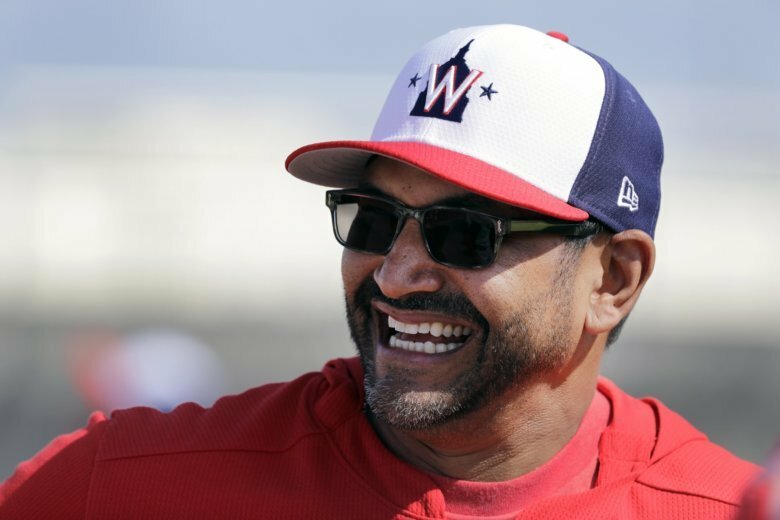 If the Nationals do succeed, they’ll do so as a different unit, without the figure so tied to their rise to prominence. Harper was the inspiration for and the key to NATITUDE, to the first winning generation of Nats baseball. This team belongs to others now, and their identity will define it. We don’t know what that looks like yet, but better or worse, it won’t be the same. So, back to A.J. Preller. It feels safe to say that no such shirts would exist, much less be printed and hung in the Padres’ clubhouse if not for the team signing superstar Manny Machado to anchor their core of young talent for years to come. And yet, read the replies — Padres fans were drooling, clamoring for their own, showing proof of purchase orders. But this is hardly the unofficial fan uniform — Petco Park will be a sea of Machado jerseys come Opening Day. The Nats still have plenty of talent, with no glaring holes in the lineup. Their rotation is one as well built for the playoffs — at least one through three — as they’ve had since at least 2015. Of course, that was another manager’s second year, one that never came together, despite the preseason hope. This team will enter 2019 with as good a reason as any in the last few years to believe they can compete; that they can make the playoffs; that, perhaps, they can finally get out of the division series and potentially win a pennant or even a title. If they do those things, it will be reasoned that the decision to let Harper go was the correct one. But either way, we’ll never really know from a cost-benefit perspective. All we know is that the era of Harper’s and the Nationals’ simultaneous rise to prominence, which elevated the team from afterthought to contender, is over. Many fans seem to have accepted this as the simple cost of doing business in baseball these days. But it’s hard not to feel like the club could have had it both ways, if it had really wanted to.